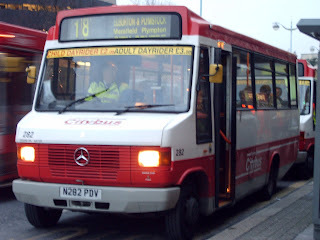 I have recently heard that there will be a model lunched of the Plymouth Citybus Dennis Dart MPDs. These will be the ones that ran the yellow and green Park and ride service that First took over. It has not been announced which fleet number it will be and when it comes out will be around £20. Sorry. 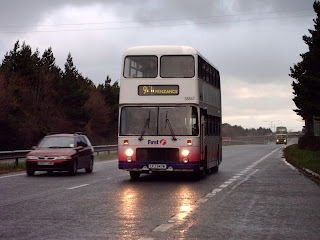 Yesterdays post about Stagecoach using a Dennis Dart on X38 was wrong it is acctually being run by a Volvo Olympian. 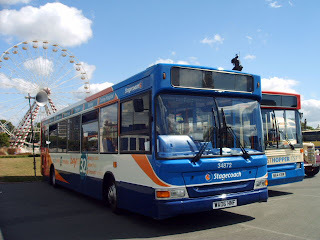 Stagecoach have just began running the Hong Kong type Dennis Darts on the X38 from Plymouth. This in my opinion is not a very good decision as it is quite heavily populated, it is a long distance route and it is motorway route all the things the Dennis Dart is not good at. Why can’t they use the Dennis Trident like nearly all of the other routes Stagecoach run. 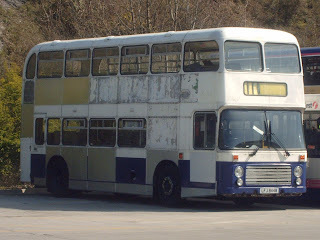 Even something like a Leyland Olympian would be better as they are just so mush more comfortable and pleasant to be on. Or should they be pioneers and use some radical new bus like First’s park and ride Dennis Enviro 400s or even better the first Dennis Enviro 500 in Britain. Just a little note to Stagecoach, try harder next time. I am sorry for all the false information I have given you on the position of 34002. Well this time it is definitely right as I was on her today. 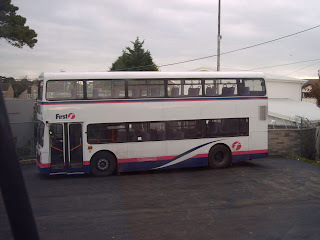 I have been told that while in Plymouth on overhaul she has had her brakes realigned as was demonstrated today when we braked really hard nearly hitting the car around Millbrook lake when apsolutely everyone on the bus eigther fell off there seat or hit there head on the hand rail . But the major thing was her engine. She has had a compleat rebuild of the engine which was striping out the whole of the engine, cleaning it and replacing broken bits and then put back in. I am now pleased to announce that she is working fine but for how much longer? Only time will tell. For my birthday on the weekend my mum made me a cake of a Bristol VR in Barbie 2 livery. My mum and dad used to own a bakery so are expierienced at this kind of thing. Just thought you might like to have a look at it but the fleet number on the front (38844) is wrong as she was painted in FG1. The Tamar Link gift set by Corgi was at first £50 in Antics Plymouth. It has now come down to just £25 because they bought too many. The two sets contain a Dennis Trident eigther Egret/32758/WA54 OLT and Spoonbill/32760/WA54 OLR with a Mercedes Vario eighther 50301 or 50306. This is also happening with the Creative Master Dennis Dart 40002/Kingfisher/S764 RNE which has come down from £25 to £10. Why do people miss public transport? Just because I felt like it a nice picture of rival company boats Tamar Belle(nearest) and Spirit of Plymout h(furthest). Because there still isn't any news I thought today I would ask the question why do people miss public transport. This sparked on me today when I had just been out in my boat for her first voyage of the year preparing for the race tommorow when the Cawsand Ferry had just pulled in. It was exactly on time and about 20 people got on. Then when it was pulling away about 6 people came running down the beach. It was by then 5 minites late so didn't have time to caome back in so they would have had to take the 81B all the way round or go via Cremyll, but why did they miss it in the first place. You can see the boat from Cawsand about 15 minites before it gets to Cawsand, it was running late, they probemly knew what time it was and they probebley were bored because they were on the first ferry of the day. So really there was no excuse to miss it. But this doesn't just happen on the ferry it is all kinds of public transport and they all know when it comes. That's the other thing. Buses are often a couple of minites late, so everyone catches them but when they are on time most of the people that get my bus miss it because it isn't usual for it to be on time. They should be out anyway waiting for the bus. I've never missed a bus in my life so if I can do it why can't other people do it? 52534 a comen sight at Torpoint? 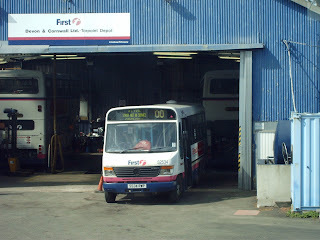 First Mercedes Vario 52534 is seem to becoming an often sight at the Torpoint depot. In the past 3 weeks she has turned up to my bus stop. I am seeing her many times at the depot and on our routes so I think they might be thinking of transfering her. Sorry there isn't anything more interesting but I have a narrow bracket for news so it can be difficult. As I have said in a previous blog the 34 often missses the Cremyll Ferry. Well now they have a duplicate service run by a Mercedes 814D on the popular routes or the ones that often miss the ferry. 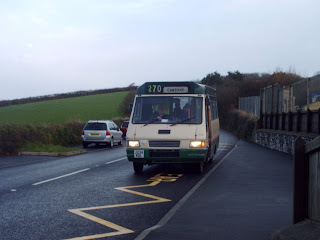 Therefore they have taken on a new lady driver who used to work at First Devon and Cornwall Torpoint depot (there was only one) to opperate it. I hope to bring news about her after her court case with First. 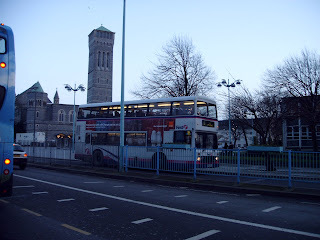 Anyway I would like to say for this achivement well done Plymouth Citybus! 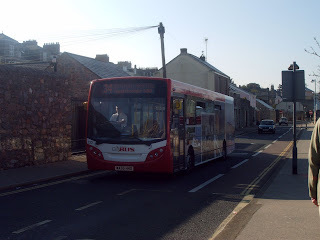 Today I heard that there will be a model of the Dennis Enviro 200s. They will be made by Creative Master. I don't know what fleet number it will be but the model should be good as always with Creative Master. It should be avalible in about 6 months but nothing has been made official yet. I will update this when I can. This is a picture of when 34002 had just come to Torpoint when she had just been painted also note the tarmac in the depot which had only been layed a short time before the picture was taken. Today I can't think of any new news so I am telling you what is wrong in previous posts. 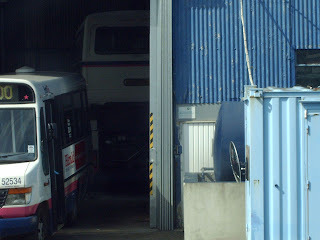 I said that the Torpoint Volvo Olympian 34002 had gone into Laira Bridge depot to be fixed or have an engine replacement. And recenyly I said she had returned but not been fixed. Well this was wrong she is acctually still in Laira Bridge depot and the picture was acctually of Leyland Olympian 30065. Thank you to Luke Farley for this. 81B acctually runs every 1hr not 1hr 10mins. I did know this but I wanted it to sound more dramatic. A-line travel did not run on good Friday. Brittany Ferries have not changed the price from Plymouth to Santander and has acctully risen to £59. Plymouth Citybus don't acctually have a Dennis Trident it was just in the depot waiting to be painted into the 'Mayflower Link' livery or being stored there. Sorry this isn't very interesting but at the moment there is just no news at the moment. Well a couple of days ago First updated their website so now it has pictures of the region you are looking at above. But the informatoin hasn't really got much better it still can't find my route sometimes and are not always up to date. 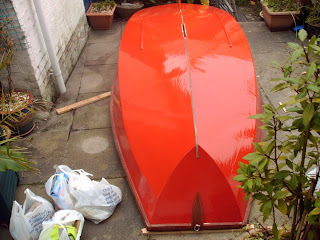 Sorry I didn't post anything yesterday I have been sanding down varnishing and painting my boat. She is a small sailing dinghy which is called a mirror. She is 15 years old and is hull number 26511. I've now named her "Tipsy". She is a wooden boat now painted in red with red sails and is varnished wood inside. "81B is currently running 45 minites late". The top picture is of 34812 in Cremyll. 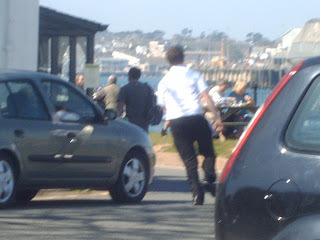 On that day I got off the Cremyll ferry after going to Plymouth and expected to wait 3 minites for the bus to turn up. Well I had waited about 20 minites and then got so frustrated I was thinking about writing a complaint to First as this has been happening sevral times this week. But then a nice young lad working in the Edgcumbe Arms (Is also a bus spotter pictured above) came up to me and told me the bus was running about 45 minites late. It turned out it came 50 minites late 10 minites before the next bus was due and they are only every 1hr and 10 minites. 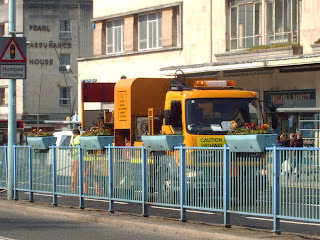 And this has been an often occurence latey because of traffic in Plymouth and Witsand bay because of the Holiday makers. My advice to them is to get the bus! Thats what they are there for. Today I am going to talk about the state preservation and history of my favorite Bristol VR LFJ 844W. Yesterday I was in Plymouth. I had been thinking for a while about going in to Laira Bridge depot to see how the retoration of LFJ 844W was going in the hands of the 'Western National Preservalition Group'. I had been told that she would be re-appolstered, re-pannaled, have a new clutch and be re-painted into the old Western National livery of cream, blue, red. To my shock when I walked into the depot they had done appsolutly nothing except take out the blinds and do a bodg job on the bodywork with just cover sheets of metal. She had been away for nearly a year now and I was expecting a lot more than what looked like it had been done in an afternoon. And after all this loyal service all her life she deserves more. I was even expecting her to ba at the Last Bristol VR Running in Penzance in December or this years Plymouth Hoe rally but at this rate it won't be ready for about 2-3 years let alone months. Well I don't know much about her history and would like to so anyone who knows anything more about the history, the restoration project or has driven in her in the past please e-mail me ( laurencemayhew@btinternet.com ). Well she started out in 1981 and had been made for the Western National Omnibus company. Two years later she was moved down to Western National and baced at Torpoint depot where she was converted for use on the Torpoint ferries. She lived a hard life there where she was pushed hard on routes like 81B and 81A. Where she also developed a very high pitched wine like the other buses at the depot and more so that normal VRs. She was then renumbered in 1999 from 1200 to 38844. In this time somewhere between 2000 and 2004 she was moved to Plymouth for a short period and then came back to Torpoint in early 2005. 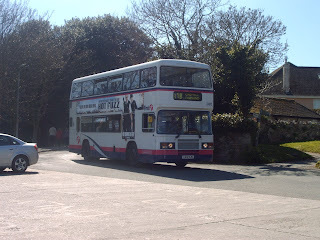 She was then one of the last Bristol VRs left in Torpoint and Plymouth along with LFJ 846W and LFJ 847W. Then people srated wondering which would be next to go. Many sucpected it would be LFJ 844W because she was in the poorest condition but early one Tuesday morning I was LFJ 847W on route 81B going to Cremyll when she started to lose drive, became difficult to get in gear and was overheating. She krept up Fourlanesend hill at about 1 mile an hour. We then rested at the top of the hill for five minites to let her cool down. We then got as far as we could but at the bottom of Southdown hill she finnally gave up the ghost and I suppose that was the deciding factor so about two weeks on she left. That left LFJ 844W and LFJ 846W. It then seemed obvious that LFJ 844W would be the next go but in May suprisingly LFJ 846W went and so LFJ 844W was the last Bristol VR left at Torpoint and in Plymouth. She then hung on until August when she left. Now for nearly 3/4 of a year she still sits in her little corner of Laira Bridge depot just waiting for the day she is used again and if that doesn't happen she's mine. Sorry its a bit late but last week on the 1st of April the new Dennis Tridents Plaxton Presidents came into service on route 93. They have been painted in a green, cream and blue livery with 'Mayflower Link' branding. The reason I have only just posted it is because there is currently only two and one of them is not working. These buses are fleet numbered from 32846. So theses are the buses that were used on the First Park and Ride service before we got the Dennis Enviro 400s. I had been in 4 times before to get a picture of one but it was always the normal Tridents. So at the moment there is only 1in service but there should be more in the future. Service 10 is to be retimed to depart Royal Parade 5 minutes later in the hour this is to ease congestion on Royal Parade Stop A7. The service is to operate via Carradale Roadreplacing facilities that are currently provided by Services 46 & 47 Monday to Saturdays. Service 20 has had the extensions to the Barbican replaced with New Service 25. MostServices from Plympton continue to the Barbican. Through Fares will be available.Service 21 & 51. .Service 49 the 15:00 Service that terminates at Wembury is to continue to PlymouthCity Centre Monday to Saturday. Service 50 from Royal Parade to depart 07:30 instead. 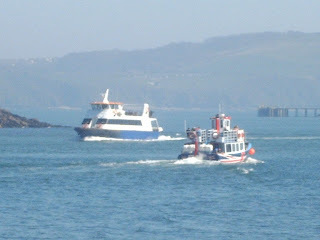 The Western Maid is the ferry service that runs between my village of Cawsand to Plymouth Barbican. Yesterday she made her first trip of the year after her refit. She only runs in Spring and Summer so is only used by holiday makers. And the first ferry is 9:00 so it is impossible for commuters to use it. So we have to take the 1 1/4 hour journey on the Cremyll ferry instead of the 35 minite journey on the Cawsand ferry . It is a very nice trip thought but is quite often not very reliable because of the weather. Today as I am sure you know is good Friday. So today that means that buses, ferries and trains will be running to Sunday service excluding the Brittany Ferry. This also does not include A-Line Travel buses as pictured above. 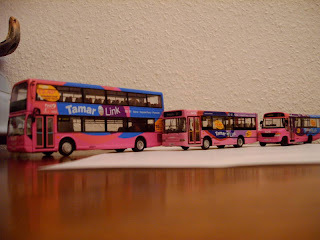 It also does not include the Maker with Rame Community bus on its trip to Tavistock. 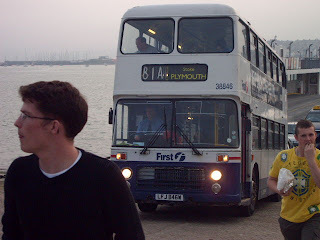 38846 LFJ 846W disembarks from the Torpoint ferry in her last month of operation. Today I am going to do my only ever blast from the past for about 5 years. Because I only started liking public transport a couple of years ago I don't have a very extensive photo collection. I did like them just before the last Bristol VRs went but I was on them every day and I had lived with them all my life so I thought of them as a very common thing so I didn't make a big fuss over them. But then it was too late. I didn't have any pictures of them except this one. I now suffer from a diseise I call "vritise" which is the withdrawal of Bristol VRs. So here it is. It isn't really that good either. Darn the public having no respect for these beautiful machines. As I have said in a previous blog 34002 has gone majorally wrong and went into Laira Depot to be fixed. Well it has returned to its little corner in Torpoint depot still out of service. I had quite a close look at her but all that seems to have been done is it has had a little bit of a clean up but no parts have been changed. I was talking to a driver and I asked him what they were doing with it. He replyied "I haven't got the foggiest idea". So it is still out of service. The question is what will they do with her next. I will keep you posted on this but my prediction is that she might come to a sticky end. 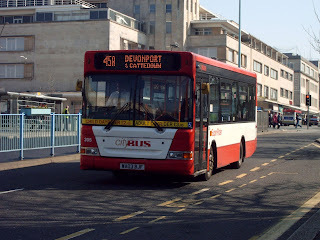 I don't know if I am the only person in Plymouth that doesn't know this but today I was on a bus going past the Plymouth Citybus depot and I was looking in the right side of the depot. 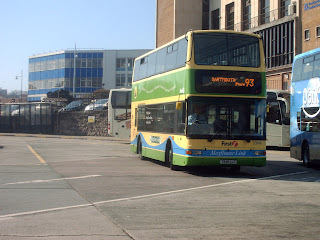 In that part of the building was one of the ex First Plymouth Park and ride Dennis Trident Plaxton Presidents double doors which ran the route before we got the Dennis Enviro 400s. I am not sure of the fleet number. It still has retained the First livery and its second door. Maybe this is a new leaf in Plymouth Citybus's book and we will see the introduction of some low floor double deckers. Only time will tell. As I am sure many of you know Royal Parade is A very busy place for buses and cars in the city and can get very congested. Well today roadworks were taking place in an already very busy Royal Parade and extra traffic because of the school holidays. Parts of the car lane were getting blocked so cars were forced to come into the bus lane and block or carve up the buses. There were some very near misses. First Devon and Cornwall have a few days ago proposed to Tamar Cruising a bid to take over the running of the Cremyll ferry. It is still in its early stages but the vessel Northern Belle needing to be replaced they need money above you can see a drawing of the Northern Belle in its proposed livery the same as the Tamar Link buses.